โปรโมชั่น ที่พัก โรงแรม รีสอร์ท ราคาพิเศษ มากมาย ... คลิ๊ก ( Special Promotion Rate ) ... Click! 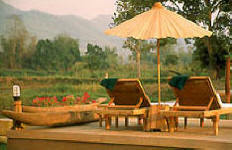 Finding a second paradise hide-out at Pai, some 2.30 hours drive from Chiangmai city. The tiny northern town, is fast becoming an artists haunt, a perfect antidode to the bustle of modern Thailand. With its burbling streams, impeccable manicured fields and surrounding mountains, shrouded in early morning mists, this tiny town with lots of activities midway between Chiangmai and Mae Hong Son, is indeed a refreshing place to visit. Belle Villa Resort Pai, your next destination base to enjoy all the above, just a good walk from Pai city, is a serene boutique resort located amidst nature and rice field. Here at Pai, awaits your discovery at it's fascinating culture and enjoy endless activities such as excursion to "Pheeman Cave" one of the unseen in Thailand heritage, take a walk through Pai market and explore Pai' scenic view from Pai canyon and you will realize that it's difficult to describe the charm of Pai that draw visitors back time and again, and only to be there by your own self can tell why. Mae Hong Son Hotels: The Imperial Tara, Fern Resort, Huai Nam Rin Resort, Golden Pai & Suite Resort, Ban Rim Pai Camping, Baiyoke Chalet New!, Gims Resort New!, Ngamta Hotel New!, View Point Lodge New!